Tomochichi is born. Exact date and location is unknown. Yamasee War takes place between the Native Americans and the British colonists in South Carolina. Yamasee Indians, angry over settlers encroaching on their lands and unresolved debts arising from the fur trade, attack and kill colonists along the South Carolina frontier. Many other Native American tribes near South Carolina and the Savannah River join forces with the Yamasee, with the exception of the Cherokees and Creeks. The years following the war cause a great deal of division amongst Native Americans in the region regarding future interactions with Europeans. Tomochichi forms the Yamacraw tribe. The tribe consists of Lower Creek and Yamasee Indians who left their respective tribes over disagreements regarding future relations with European settlers. The Yamacraw settle on the bluffs of the Savannah River, an area in close proximity to the final resting place of their ancestors and to English traders from South Carolina. A View of Savannah as It Stood on the 29th of March 1734. Georgia Historical Society Map Collection, MS 1361MP. 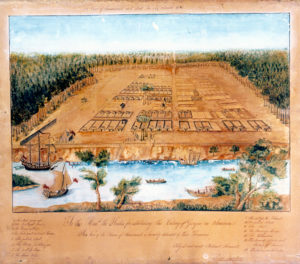 General James Edward Oglethorpe and the first 114 colonists from Great Britain land at Yamacraw Bluff and establish the Colony of Georgia. British and Indian Sketch. Image Courtesy of Ed Jackson. Oglethorpe and the Yamacraw agree to a peace treaty between the Yamacraw and the colonists. 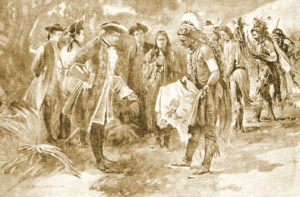 At this time, Oglethorpe and Tomochichi exchange gifts. Tomochichi gives Oglethorpe buffalo skins “on which an eagle head and feathers was painted.” Oglethorpe presents the chief with European-styled clothing, cloth, gun powder, tobacco, and pipes. Tomochichi and a delegation from the Yamacraw tribe travel to London to meet with the Georgia Trustees and King George II. While in London, Tomochichi advocates for fair trade agreements and education for his people. A school is opened for the Yamacraw at Irene (on property owned by the present-day Georgia Ports Authority in Savannah). Oglethorpe travels to meet the leaders of the Creek Nation at Coweta to reinforce the existing relationships, which primarily revolve around land and boundaries between the Native Americans and the British. Tomochichi dies and is buried in Wright Square (formerly Percival Square) on the orders of General James Edward Oglethorpe. Oglethorpe acts as a pallbearer at the funeral. Tomochichi’s obituary appears in The Gentleman’s Magazine in London.